Sometimes we make a beer that we all love so much that is hard to do an impartial write-up of the beer’s flavors and aromas without sounding too sales-y or over the top excited. So, let’s just get this out of the way right now – our team is going a bit gaga over the next two beers in our Rare Breed Series. The first beer – a Boysenberry Dark Cuvée – will be available this coming Thursday, February 7th. The next beer – a Port Barrel-Aged Imperial Stout (Five Minute Fugitive) – will be available starting February 20th. What is it about these two beers that is getting us so excited? Well, we absolutely adore big, complex, roasty, big bodied dark beers with the perfect amount of subtle bramble berry and jammy fruitness. To us, that’s THE sweet spot for beers that should be slowly savored sip by sip. It’s the type of beer that we love to share with friends, and that we also love to drink as a dessert in and of itself. Since the Boysenberry Dark Cuvée will be released first, below are our tasting notes on this special beer. In two weeks, we’ll post our notes on the Port Barrel-Aged Five Minute Fugitive. 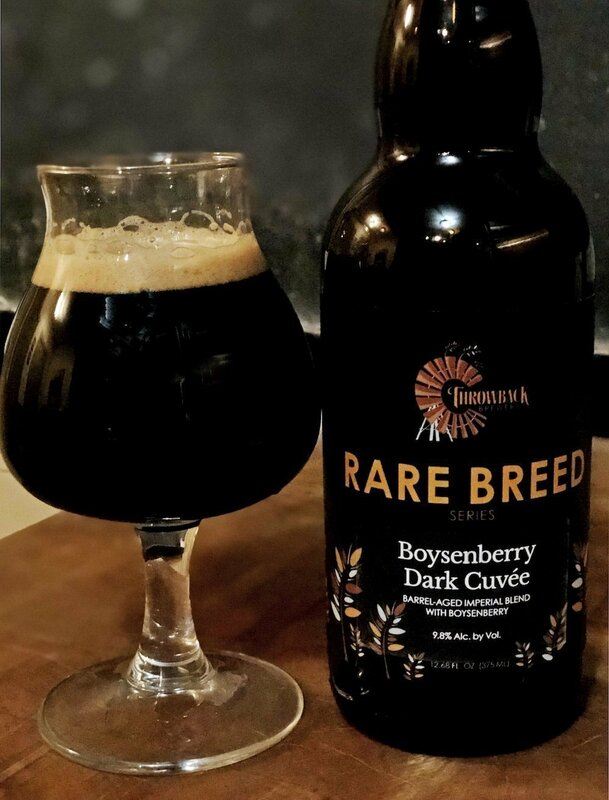 Boysenberry Dark Cuvée is a cuvée of a rum barrel-aged Imperial Porter with a Four Roses Bourbon Barrel-aged Imperial Stout that’s been finished with boysenberries. This jet black beer features a soft and creamy mouthfeel with flavors and aromas of dark chocolate, black coffee, bramble berry, oak, tobacco, and red wine. (Note- for those of you not familiar with the term cuvée, it is simply a fancy term to describe beer that has been blended from 2 or more barrels). – Appearance: This jet black beer with ruby undertones features a caramel-colored head that dissipates fairly quickly. The beer will leave a lovely lacing on the glass. – Aroma: The aroma on this beer is heavenly – it’s like a chocolate dark berry jam with undertones of wood, booze, and wine. The fruit-forward aroma can be mostly attributed to the addition of boysenberries, which taste and smell like a cross between a blackberry and raspberry. – Taste & Mouthfeel: There’s a lovely complexity of flavors in this beer – blackberry jam, roast, dark berries, dark chocolate, coffee, tobacco, red wine, and oak, with a slight bourbon alcohol warmth and a very chocolate finish. The body on this beer is nice and big, and the mouthfeel is smooth and velvety. – Pairing: We love food, but, honestly, this beer is best savored by itself. If forced to pick something, we’d recommend a flourless chocolate cake, high end whoopee pie, and a fine chocolate bar. – Serving glass: A snifter glass would be most appropriate for this beer. Also, we recommend letting the beer warm up just a bit before drinking it. That will allow the flavors to open up, fully bringing out the chocolate-covered berry notes. Our Rare Breed Series features unique and whimsical barrel-aged beers that are often made only once, yet are extraordinary enough to be bottled and shared with you. While we may make many barrel-aged beers over the course of the year, only the very, very best will make it into the Rare Breed bottles. The first six Rare Breed beers will be sold as a series, which is on sale now online or at Throwback Brewery (7 Hobbs Road, North Hampton, NH).